Packing bags. This task is so tedious. What to pack? How many to pack? Am I packing more? Am I leaving out important stuff? If it is a trip to India, my bags are usually empty, as I have the extra clothes all stocked up, back there – washed and ironed. And when travelling back, its my mom who usually packs my bags.The process of packing usually takes 2 or 3 hrs. Adding packets, weighing the bags, then removing and again weighing and again adding.. and it goes on. This Saturday I am flying to US, to visit my darling sis. I have my suitcases scattered on floor with clothes and shoes around. I hope I can finish at least by Friday. 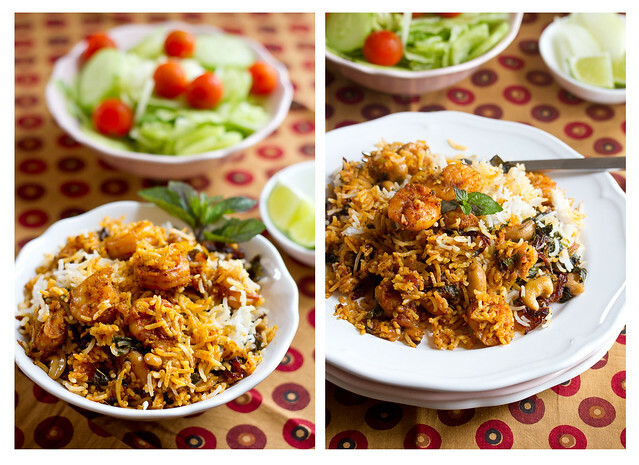 To keep him happy and to make it up for the 3 weeks, I made this delicious biryani for him. The list of ingredients is very long, but you can notice that the process is very simple. So go ahead and try it! Wash rice 2 to 3 times, till water runs clear. Soak rice in enough water for 30 mins. Boil water in a big vessel, add all ingredients from Cloves to Oil. Drain the rice and add to the boiling water. Add chilli powder and turmeric to prawns and keep aside. Add salt to the prawns. Fry prawns in the oil till they are nicely fried forming golden crust on the top. Remove prawns and keep aside. In the same oil, add sliced onions, add salt and fry till golden. Add curry leaves, ginger garlic paste, coriander powder, garam masala powder, green chili paste, turmeric and red chili powder. Now add the fried prawns and mix. Add in stock and lemon juice and coriander leaves. Mix well and turn off heat. Take a wide, deep pan/vessel. Layer half of the rice at the bottom. 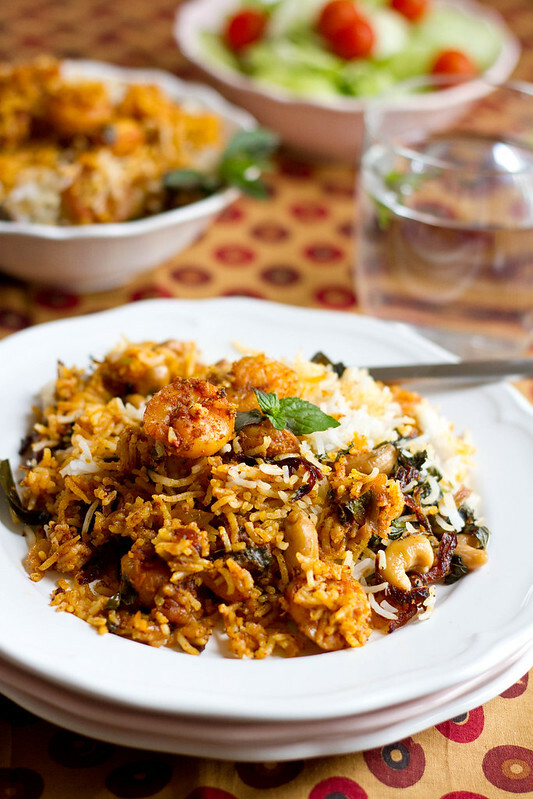 Place prawns masala mixture on bed of rice evenly. Layer remaining half of the rice on the prawns layer. Top it with caramelized onions and cashew nuts. Put an even tava on the stove and on this put the pan. Turn the heat to medium low and cook for 30 mins. Mix well and serve hot with raita. I love shrimp or prawn more than any meat or fish. 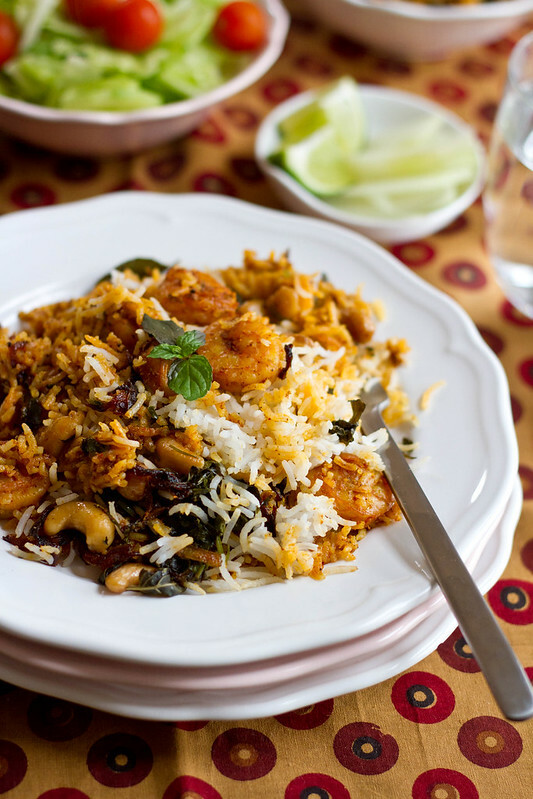 This dish reminded me it’s been ages since I made prawn biryani. What a lovely presentation..happy journey, have loads of fun! 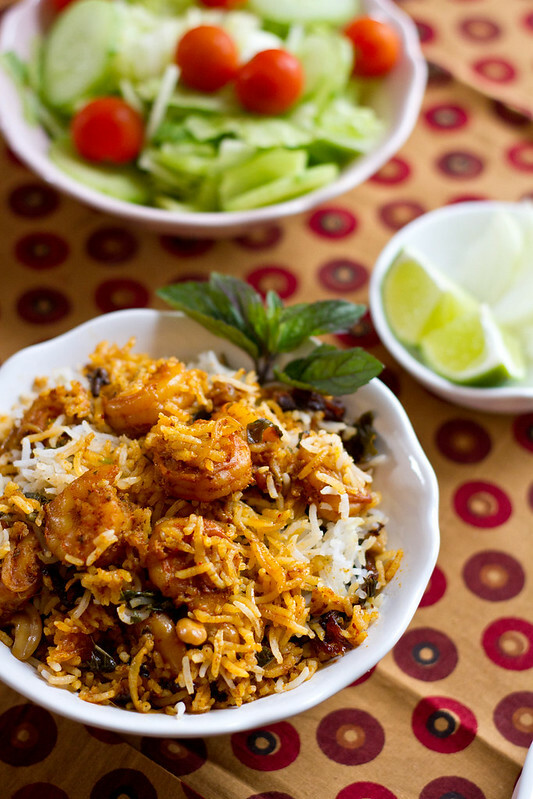 Yesterday cooked Prawn Biryani. It was fabulous, thank you for the recipe.